This is a brand new recipe. I’ve never made it, or really anything like it, before today. 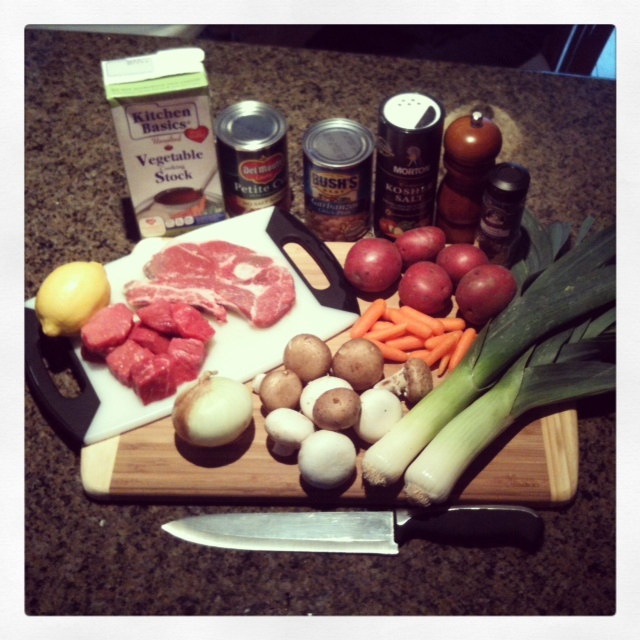 In fact, I wasn’t even sure what would be going into this stew when I went to the grocery store to pick up the ingredients. I had a basic plan to make a Mediterranean stew, and I knew I wanted some lamb in it, but otherwise I kinda made it up as I wandered the store picking out ingredients that looked fresh and tasty. The results were excellent, and this is definitely a recipe that will stay in my main rotation now. If you’re not a big fan of lamb, this could easily be made with pork or beef alone, but the lamb really makes it great in my opinion. 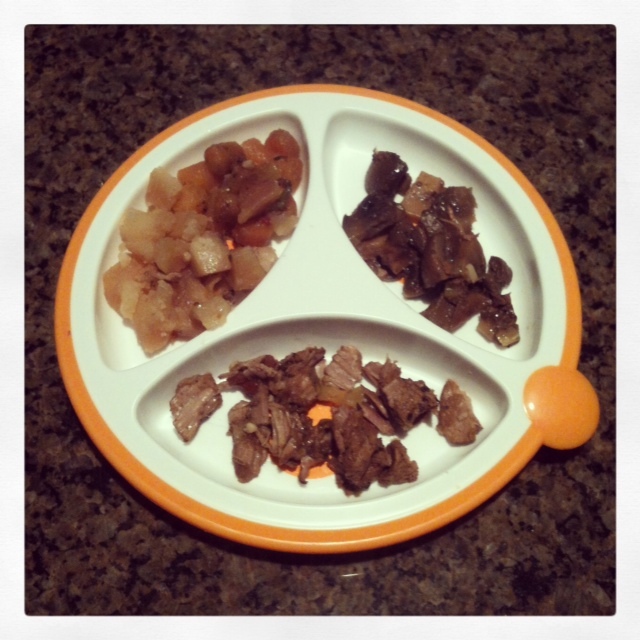 And, even our little guy chowed down on the lamb, which was tender and mild after a long swim in the slow cooker. So, here we go! Start by cubing your meat. I used stew meat as my beef, so I simply cut the big cubes into smaller cubes. As for the lamb, I used shoulder chops, which were a little more work. After cubing the lamb, I saved the bones to add to the slow cooker to enrich the stock as it cooked. 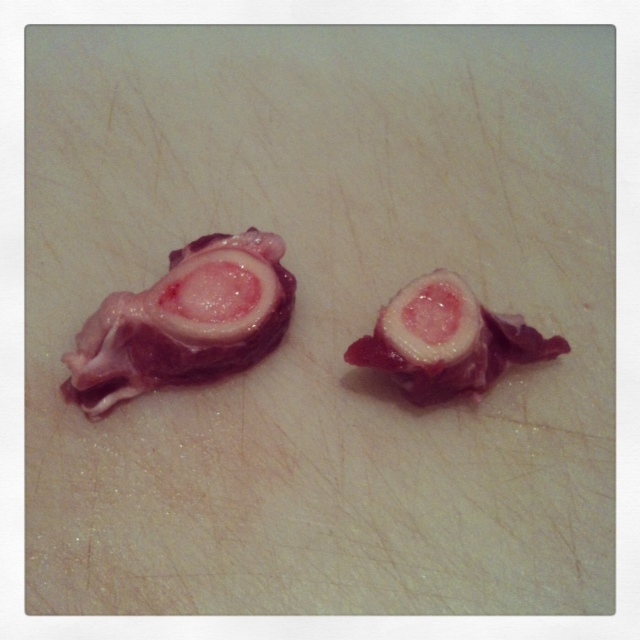 Little meaty bits of goodness waiting to be cooked off these bones…and sweet sweet marrow. Yum. 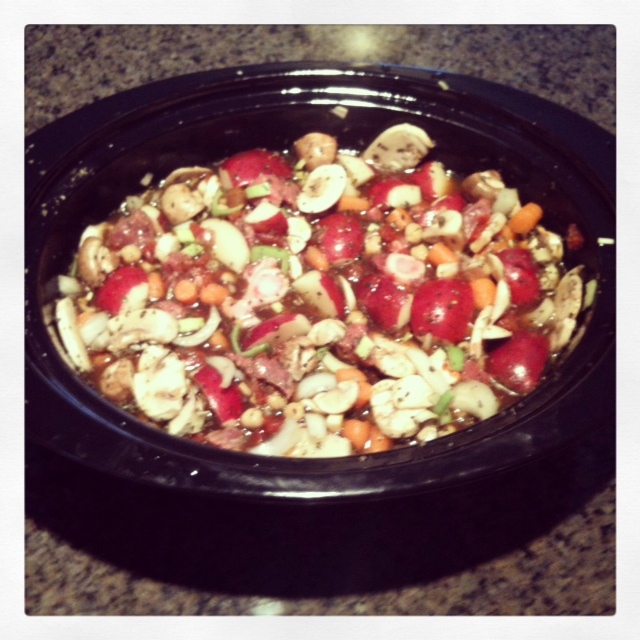 After placing all the meat in the slow cooker, start slicing and chopping your veggies, potatoes and mushrooms. Add them, the canned tomatoes and garbanzo beans to the slow cooker. Add the garlic, herbs, salt and pepper. Add the worchestershire sauce, lemon zest, lemon juice and vegetable stock. Stir gently to combine and evenly distribute the ingredients. Cook on low for 8 hours. I served this stew over a whole grain cous cous, which did a great job of soaking up the stock at the bottom of the bowl. 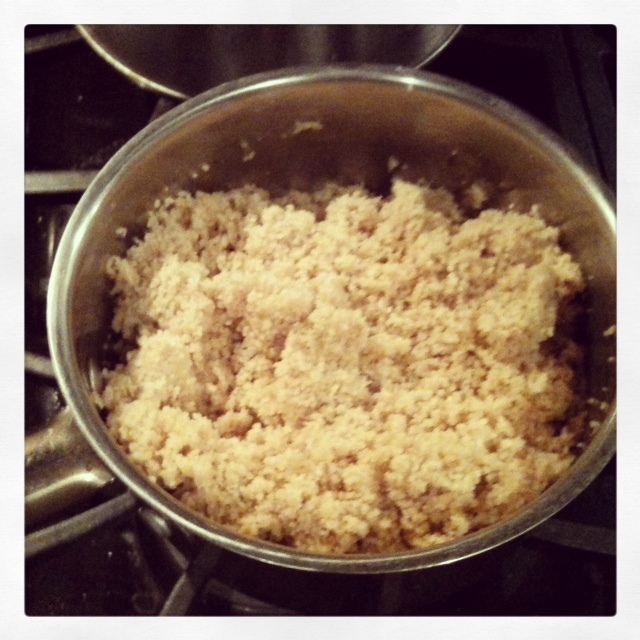 Cous cous is a great time-saver when you want a starch with your meal without the time of making rice. Cous cous – a simple side dish, ready in 5 minutes. 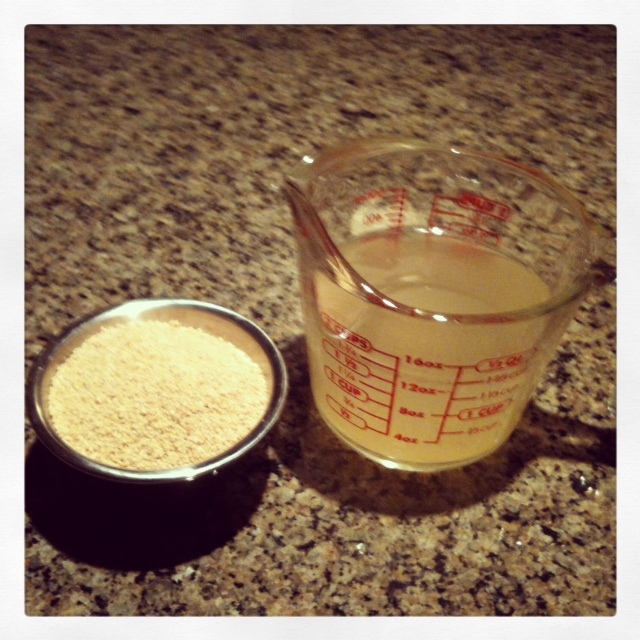 In a pan, bring 1 1/2 cups of chicken stock and a tablespoon of olive oil to a boil. Stir in the cous cous, turn off the heat and cover. Let stand for five minutes, and it’s done. Fluff it gently and it’s ready to serve. 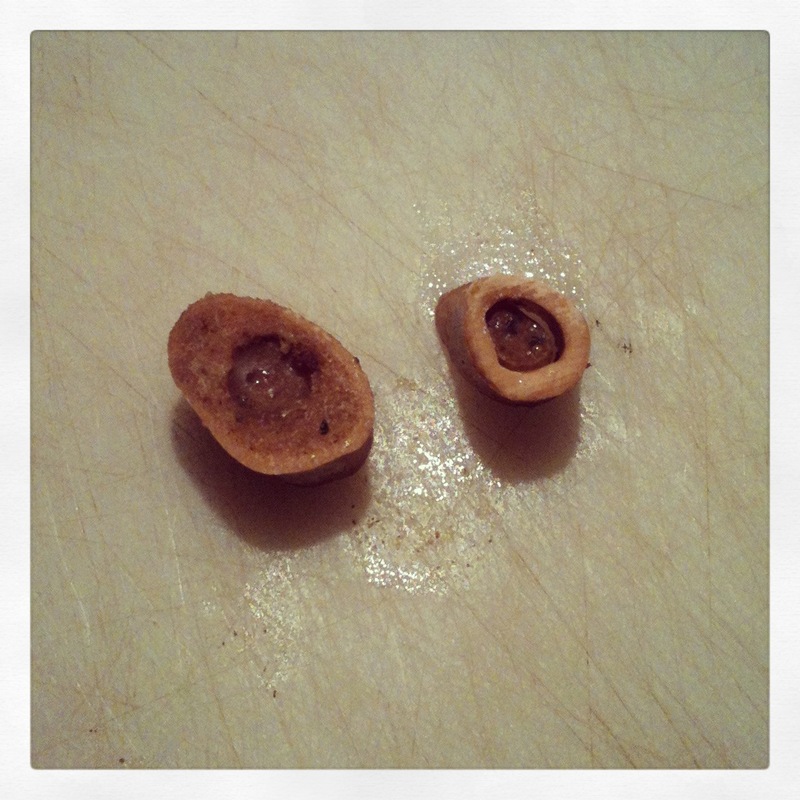 Once the stew is done, make sure you fish out the bones before serving, especially if kids will be partaking. 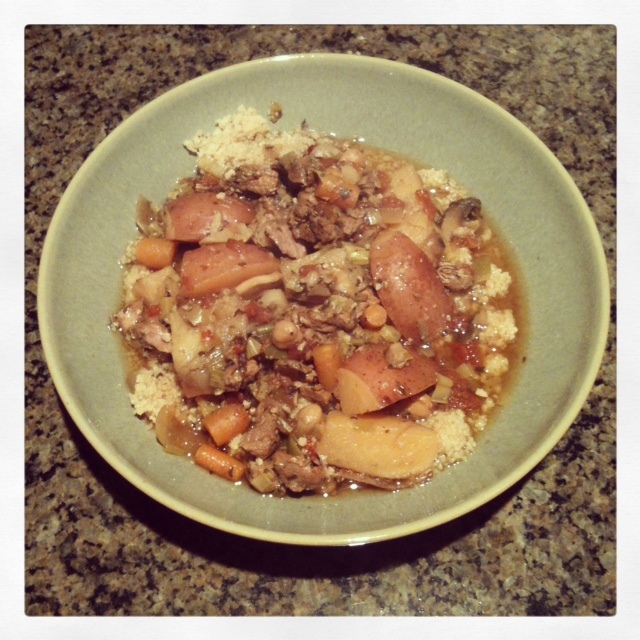 Serve the stew over the cous cous with a healthy dose of stock. It is easiest to eat with a nice big spoon, and possibly a roll on the side to mop up any stock the cous cous doesn’t soak up. Enjoy! And, as far as sharing this meal as “eats for all ages,” our little guy loved this stuff. He tore into the lamb, the veggies and especially the mushrooms. When slow cooked, lamb becomes unbelievably tender, and the gaminess becomes very mild, making this an ideal way to introduce young eaters to a new protein.